Once again trash becomes treasure on this wonderful island with no cars. We do have golf carts however and that's where this story begins. One day, while I was on our wonderful beach our friend Chad drove by in his golf cart and stopped to chat. While we where talking I noticed that there was a broken urn in the back of his cart. My brain then went into overdrive, my heart started pumping and my mouth opened. Out came the words," Are you going to throw that away? "( Did I really just say that?) Chad says,"Yes?" I say," May I have it?" He says, " Sure, what are you going to do with it?" (He had to be thinking this lady is nuts.) I said with confidence,"Something wonderful!" So Chad very kindly took this very heavy broken urn to my house. 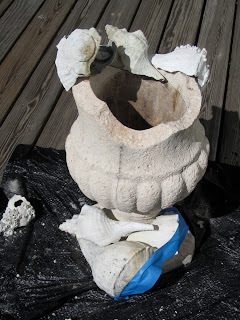 Jay was home when Chad showed up with this broken urn. Chad said to him," Your wife asked me to drop this off here." Jay gave Chad a smile and a little laugh and said" I'm sure she did." but I really had know idea how to make it happen. 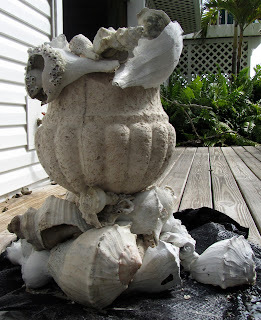 I was excited and determined to make this broken urn into something wonderful. 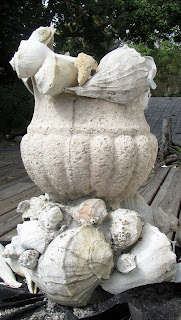 This urn is very old and has been on the island for quite some time. 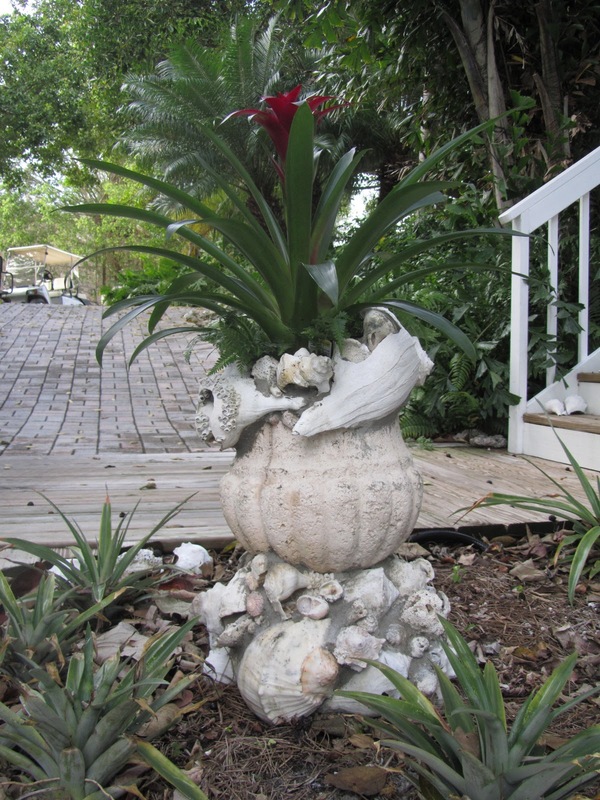 With this being said, I wanted this urn to have a very old look. 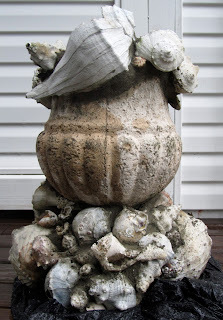 To do this I used old shells, some are broken and most of them are bleached white. Slowly what was once trash is turning into something new. My new, old urn is finished and ready to be moved into place. This urn was heavy before I started working on it. Now that I have added shells and concrete, it is extremely heavy. Thanks to Jay we have a fabulous urn placed in the perfect spot. 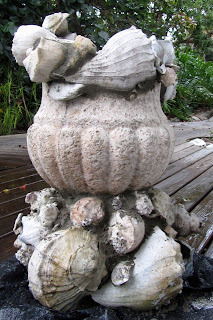 What once was trash is now my island treasure! I'm a girl with a dream. It all started with a Georgia red clay mud pie. On top there sat in all its glory a beautiful fluffy pink mimosa blossom. I love texture, all kinds. Connecting pieces is what I do. Dream with me, feel the world around you, it's amazing.